Copyright 2000 by the estate of Eric Frank Russell. Introduction copyright 2000 by Jack L. Chalker. Afterword copyright 2000 by Mike Resnick. Editor's Introduction Copyright 2000 by Rick Katze. Dust Jacket Illustration copyright 2000 by Bob Eggleton. Editor's Introduction ends with Rick Katze (over) Norwood Mass. (over) July 2000. "Meeting on Kangshan" is listed as "Meeting on Kangsham" on the story title page. An incorrect version of the title "Meeting At Kangshan" is used on the acknowledgments page and in the table of contents. The story "Homo Saps" is listed as "Homo Sap" in the table of contents. "And Then There Were None" is used on contents page and story title page, 24, this is a variant of "...And Then There Were None". The hardcover is dark green. 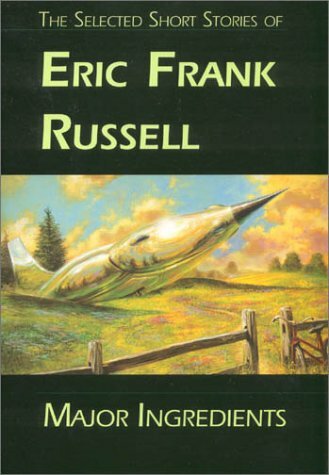 Spine reads The Selected Short Stories of (over) Eric Frank Russell at top running downwards. Followed by Major (over) Ingredients. Nesfa (over) Press (over) Nesfa logo at bottom spine. Dustjacket spine reads as above. Price located inside flap front cover top right.